Must admit, I'm a bit jealous. Can't wait to add ANOTHER Coton to our family some day. They are the CUTEST dogs ever!!! Just like stuffed animals, but better! Congrats on your new puppies! So cute - they don't even look real. Thanks so much for sharing these double trouble siblings with us. What an adorable pair.....it's hard enough for my wife and I to go away and leave Rudy.....couldn't leave two behind......no way! 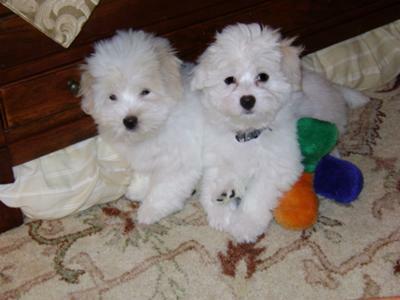 I also have Coton littermates; Eleana and Olivia, who turned 2 years old on January 9. They are inseperable and love each other, but there is also sibling rivalry and competitiveness. I hadn't planned to adopt two dogs, but when these doggy sisters were dropped into my life, I couldn't refuse. With these little Coton girls, it's not just double the love, more like love squared.